The ministry of Calvary Orthodox Presbyterian Church emphasizes the means that God has given us to grow in grace and love for him. God has given us ordinary yet profound means that make a three-legged stool upon which the church’s ministry can firmly stand. 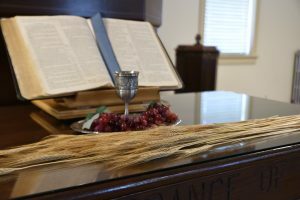 We believe that this God-given three-legged stool consists of the reading and preaching of the Word of God, the observation of the visible Word (sacraments: Baptism and the Lord’s Supper) and prayer. Therefore, our ministry is built upon the Word of God and prayer. We are not a program-driven church, but instead we highlight the importance of corporate worship on Sunday (both morning and evening). We do have other opportunities to study, pray and grow together throughout the week as well. See our calendar for more details on these gatherings. We are a member of the Orthodox Presbyterian Church (OPC). For more information and resources please visit the OPC website at opc.org.